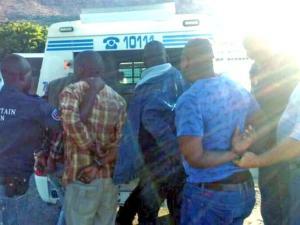 Five suspected members of a crowbar gang were arrested by the mountain men in Zandvlei. Cape Town – Crowbar burglars in expensive cars have turned their attention to Pinelands and Goodwood, striking at least nine times in the past month. The robbers drive top-of-the-range cars which blend in with the suburbs they target. In Pinelands, a gang broke into four homes within hours in just one evening. In Goodwood crowbar gang activities have become so bad that some residents have threatened to deal with burglars themselves. The thieves’ getaway cars have created confusion, making it difficult for security companies and neighbourhood watches to spot the gangs. It is believed several crowbar gangs are operating around Cape Town. Using crowbars and brute force, they smash their way into homes and sweep for valuables in minutes. In two of the most recent incidents, two Eversdal homes were burgled within 20 minutes on Thursday. Police spokesman Captain Frederick van Wyk confirmed that in Pinelands four homes were burgled on Wednesday evening. He appealed to residents with information about the incidents to contact police. Van Wyk confirmed one of several crowbar burglaries that were recently carried out in Pinelands. He said on Monday a home in Tygerdal, Goodwood, was broken into and items including a plasma screen television and a home theatre system, stolen. This week Nazeem Israel, of the Goodwood community police forum, said two crowbar break-ins were reported on Tuesday. At least five break-ins were reported in August. The gangs knock at the door or ring the doorbell to check if residents are at home, and Israel said people who were at home should not ignore a knock at their front door. If people answer the door, the burglars pretend to be lost and needing directions. The burglars then leave to try their luck elsewhere. Dirk van der Berg, of the security company Goodwood Armed Patrols, said crowbar burglaries had started in the area in November, but numbers had soared in recent weeks. Van Der Berg said residents had started WhatsApp groups to keep track of incidents and send out warnings. The burglars’ approach constantly changed. In winter, when it got darker earlier, burglars tended to strike in the evenings. Rain provided further cover. “I’ve warned (the WhatsApp) groups that it’s going to change to the day now as it gets warmer,” Van Der Berg said. In the warmer months the thieves appeared to prefer operating between 9am and noon. A resident who did not want to be identified for fear of being targeted by burglars, said his home had been robbed and neighbours were fed up. “Vigilantism is not the way to tackle this problem, but the frustration of residents can be well appreciated,” he said.